Dartmouth, on the beautiful estuary of the River Dart, was a flourishing port from the twelfth century. When the Hundred Year War made legitimate trading difficult, the inhabitants turned to piracy to boost their profits. Their unfortunate targets were the ports across the Channel. In 1404, the Bretons land in force and attempted to sack the town in revenge, but the inhabitants drove them off with great loss to themselves. According to French sources a second attempt was more successful. 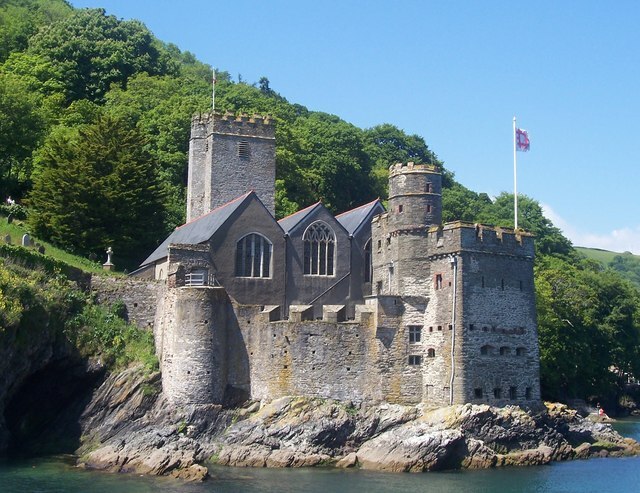 Dartmouth Castle is actually a mile southeast of the town, at a point where the estuary narrows. A fortification first rose here about 1388 in response to the threat of invasion from France. It was built at the instigation of the mayor, John Hawley, and is interesting as the earliest example of a fort built by a municipal authority as opposed to the private castle of an individual. It was a simple affair, consisting of a curtain with circular towns cutting off the landward approach to the headland. A tall piece of curtain and one shattered tower can be seen on the high ground overlooking the defenses. In view of the primitive artillery of the day it is difficult to see how this fortification could have interfered with any ships. It was also overlooked by much higher ground. Perhaps for these reasons it soon fell into disuse. The tower, which now forms the focal point of the castle crowns the rocks on the edge of the headland. It looks like two connected towers, one square and one oval. In fact, the original design was for a freestanding oval tower and the most prominent square portion is an afterthought, but there is no internal division between the two. The splayed gun ports provided a degree of flexibility for cannon fire, which was hitherto unknown. They lie in the rock-cut basement. This entry was posted in Castles, Sin categoría.